Just like any other pet, cats need good nutrition to thrive. 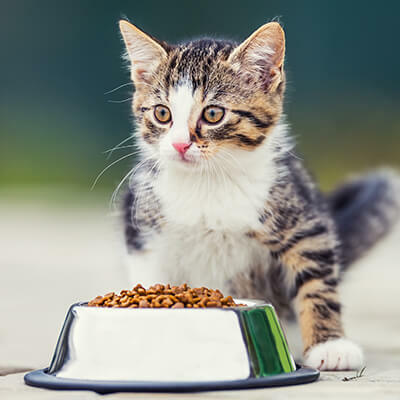 Making sure your kitty is eating a good, nourishing diet will go a long way towards keeping her healthy. Here, a Mt. Pleasant, SC vet offers tips on feeding Fluffy. It isn’t always easy to pick the best brand of cat food. Reading labels can be very helpful, but it is also confusing. Look for something that lists meat, fish, or poultry first and most often. Taurine—an amino acid—is also a must for kitties. Avoid anything with a lot of fillers, as well as brands with labels that read like science projects. Do you fill your cat’s bowl whenever she meows? Many kitties have their humans trained to feed them on demand. However, feeding Fluffy just ten calories too much each day can cause her to pack on a pound a year. That’s a lot for a kitty! Ask your vet for specific advice on portion sizes. Treats are a great way to activate the purr, and make your kitty feel loved and pampered. Just don’t let your cute pet coax you into overfeeding her. This is one reason there are so many chubby cats out there! Snacks should only make up about 5 to 10 percent of your cat’s diet. Some kitties are quite finicky, while others will steal your pizza the moment your back is turned. Take care not to feed Fluffy anything that isn’t safe for her. Some dangerous foods include garlic, onions, scallions, and chives; grapes, currants, and raisins; meat on the bone; raw meat, dough, or yeast; milk; nuts; fatty foods; alcohol; chocolate; pitted fruits (especially avocado); and anything containing xylitol. Choose foods that are appropriate to your furry buddy’s age. Kittens, senior cats, and adult kitties all have slightly different needs. Make sure that your feline friend always has plenty of clean water. You may want to get your kitty a pet fountain. Many cats love drinking running water! Don’t just let uneaten food sit around: it will soon start collecting germs and bacteria. Remove uneaten food, and keep Fluffy’s dishes and eating area clean. Please call us, your Mt. Pleasant, SC vet clinic, for your kitty’s veterinary care needs. We’re here to help!